This user friendly corded phone has 6 large one touch picture memory buttons. 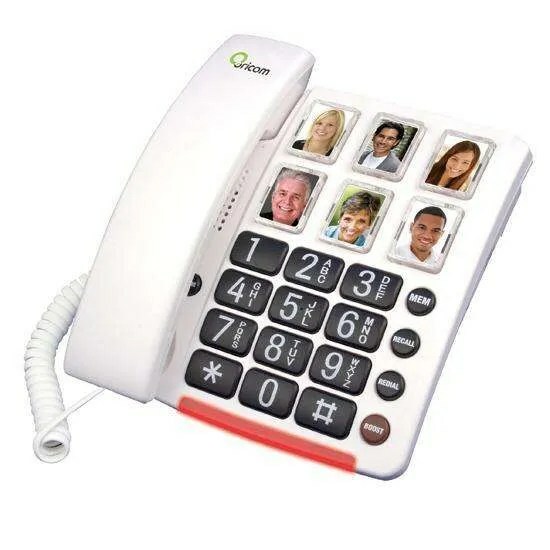 Simply save the phone number to one of the 6 buttons, then place a photograph of the person whose number is saved underneath the protective cover. That photograph then identifies your one touch dial button. This is the perfect phone for persons suffering from memory loss, moderate to severe hearing loss and or low vision. A private, fulfilling home theater experience is easy with this audiophile-grade wireless headphone system. It provides lifelike sound reproduction, Automatic Level Control and balance control for up to 4 receivers. Approved by Office of hearing services to be used for people with hearing loss for better entertainment.